Happy Friday! I hope your week is going well. Mine, crazy busy at work. I have been coming home exhausted everyday this week. So, the weekend is a welcome site! This card was a joy to create. I pretty much followed the sketch. Right down to the floral object. The card base is soft suede card stock. 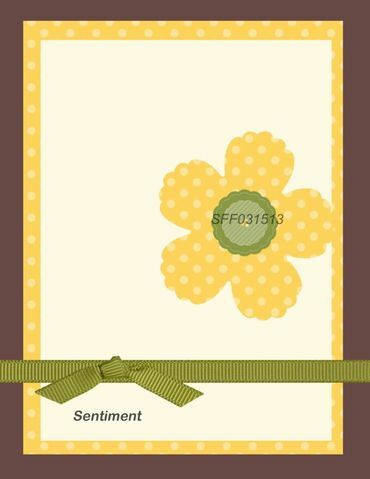 The first layer is primrose petals card stock. 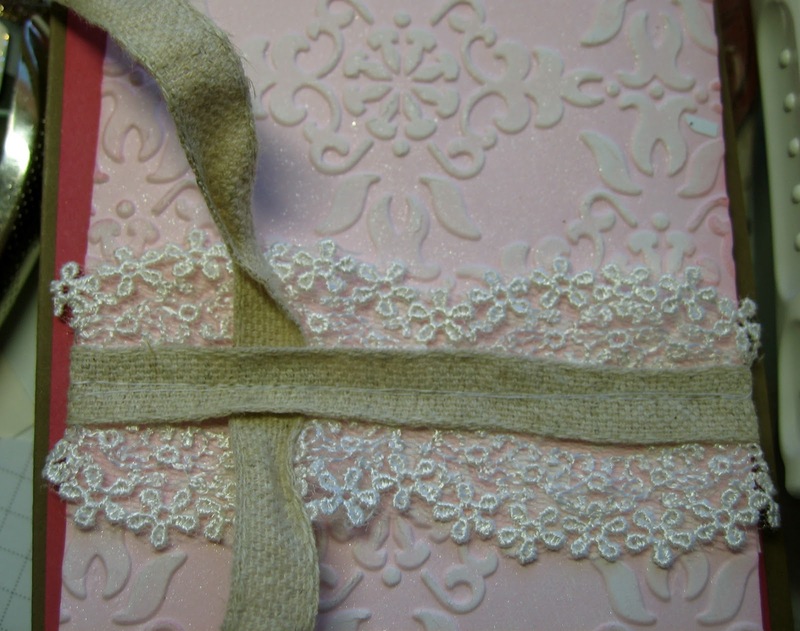 The main panel is pink pirouette card stock. 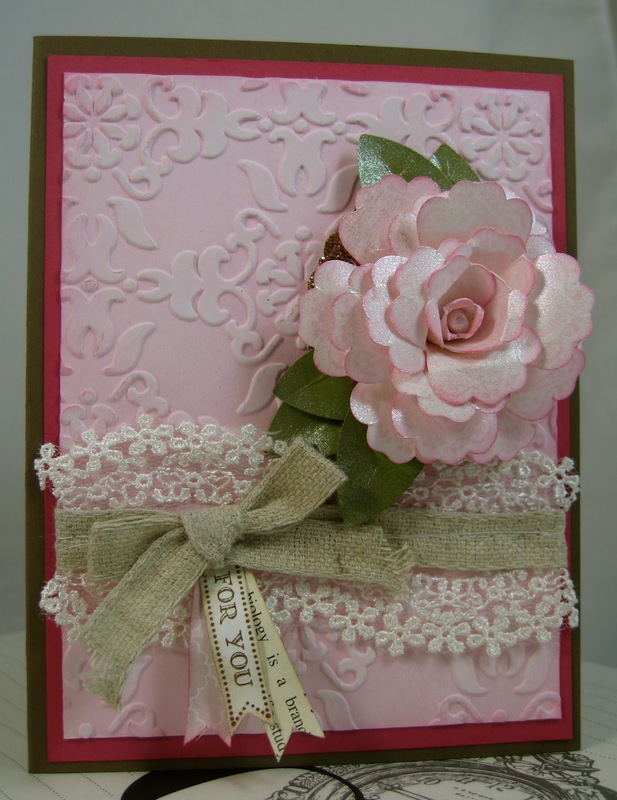 I used my vintage wallpaper embossing folder. I then rubbed my white craft ink pad across the raised design. 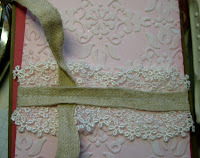 I layered the floral lace and the burlap ribbon, and machine stitched them to the card front. I then tied a simple bow. I added a trio of banner pieces. The blossom I created myself. It was actually alot of fun, and very joyful. I started with white card stock. I stamped the blossom from Mixed Bunch in pink pirouette classic ink. 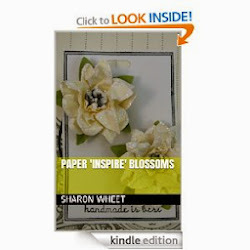 I stamped 4 blossoms, and then punched them out with the blossom punch. I cut one petal off of one blossom. And I cut two petals off another blossom. Then I cut three petals off the another blossom. And then cut the last whole blossom in half (4 petals on each half). I used a wooden kabob screwer to bend and roll the petals. I used glue dots to hold each layer together, and stacked the blossoms. I used the blossom petal punch to create the leaves. I distressed the leaves by hand. aka: I lightly spritz the leaf with water and hand scrunched and bent the leaf. I distressed the edges of the blossom petals and leaves with white craft ink and glitter. To add a bit some sparkle, I added a scallop circle of champagne glitter paper. I hope that you get an opportunity to play along with us @ SFF. We would love to see what you create! I added a hand-stamped Birthday sentiment, that is 4yrs retired from Stampin' Up!. I also added a shell butterfly pin from my embellishment stash, to this card. And finally, I added a glue dot to the trio of banners, to help secure them to the card front. Gorgeous Sharon! Thanks for explaining how you did the flower. I will be trying it out. 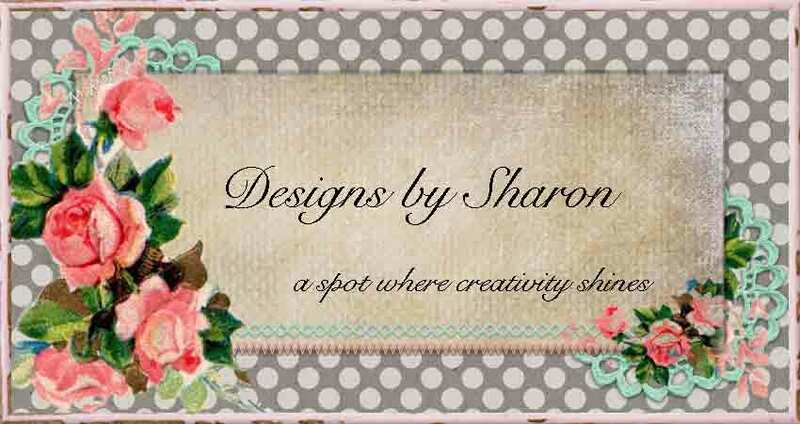 Sharon, this is just SO BEAUTIFUL! I love your shabby chic style! Wow! This is stunning! Love the colors and the flower! The lace and burlap ribbon along with the little flags are just perfect! Just beautiful!! Always a joy to see your creations. 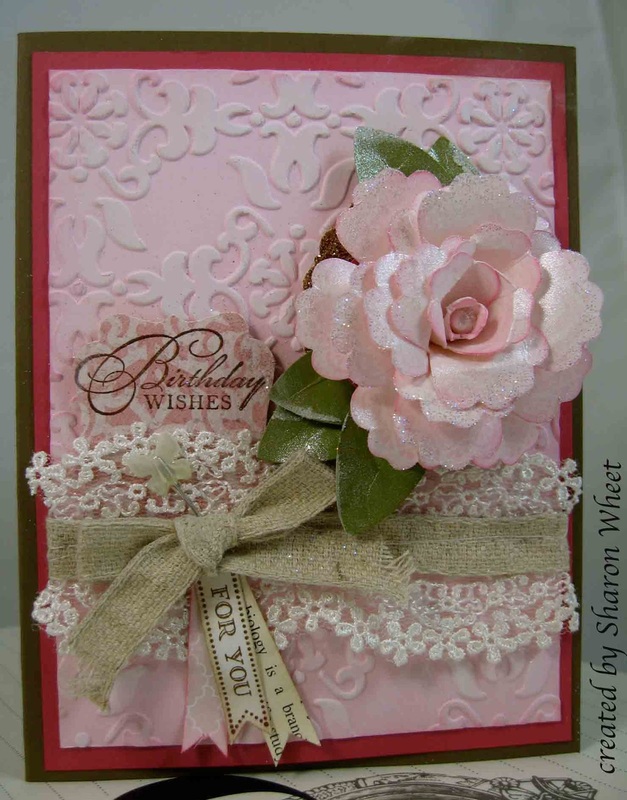 Thanks for several great ideas on creating shabby chic cards. Your card is really beautiful! As usual, you have blown me away with a soft, feminine, vintage type card. I have trouble creating these, so it is always a joy to see one done very well!